This small applet will remove the WhatRoute 1.x.x Cache and Settings files. Add 'Commands' menu to flush ARP cache, DNS cache, Flows cache. Flow Monitor - Filter Multicast and Link Local addresses. DNS Lookup - short cut items for ADSP, DMARC and DomainKey sub-types. Restore windows to correct display when using multiple displays. Local Hosts - Show IPv6 address. Menu item to Enable/Disable name resolution in Local Network window. LocalNetwork - fix IP address sorting. Preparation for Swift 5 has meant replacing the way OS types are stored for use in the Local Network window. All hosts will revert to a generic icon and will need to be respecified. Disable app translocation when detected. Embedded nfacctd updated from pmacct-1.7.2. Refactor usage of dispatch queues. Race discovering external IP address. Fixed hang at exit waiting for DNS lookups to complete. WiFi Monitor - show SSID of current connection. DNS - fixed flooding log with warnings. DNS - fixed thread leak. DNS - fixed crash on malformed IP address. Local Network - fixed drawing inefficiency. Wifi Monitor - fixed badly formed helper request that caused helper to crash. Refactor usage of MaxMind library. Refactor XPC communication with helper. DNS Lookup - specified server was being ignored by the dns trace command. Flow Monitor - Optimize IP packet alignment. Map - dont adjust text colour if the night region is not shown. WhatRoute is now notarized by Apple. Race condition in IP location lookup. Dark mode colours in text views. Compiled with Xcode 10, Swift 4.2. Improved Great Circle plots on Map window. Improved plotting of twilight zones on Map window (cue spooky music). Show nearby wi-fi acess points on the detailed map. Port scan would crash if the end port was less than the start. Delay between MAC vendor lookups to stay within site limits. Map shows areas of the planet that are in darkness with optional display of twilight zones. Country flags are now displayed using the 'emoji' (unicode) symbols. Option to sort host display in Local Network window by name. Loading the bogon data could cause WhatRoute to crash. Improved accuracy in interval timers. Improved performance in generating Flow Distribution. Added DNS Server Performance testing. 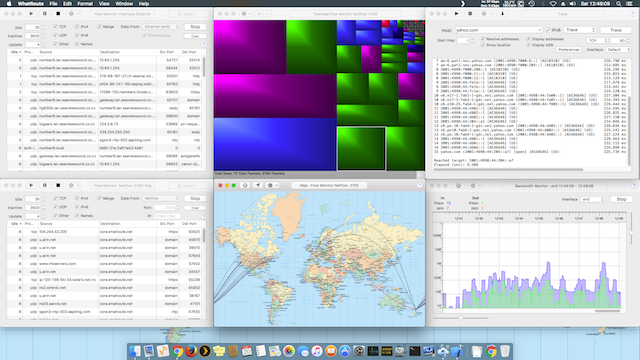 Initial preparation for Mojave compatibility. Control labels are dimmed when control is not enabled. Updated embedded pmacct to 1.7.1. Added Hide command to statusbar menu. Detailed Map Window - display flows / routes. Detailed Map Window - display node details and allow ping trace etc to that node. Detailed Map Window - display live updates. Map Window - display location nearest to the cursor. Map Window - locations are cached to disk when discovered. Map Window - faster algorithm for finding nearest place to cursor. Map Window - Alternate map projection (Miller) may be used. Map Window - User selected region on the world map can be displayed in the Map Viewer window. Map Window - Added toolbar button to display selected region in Map Viewer. Bandwidth Window - Ruler scale was incorrect when the horizontal scroller was hidden. Map Window - Removed maximum size constraint. Map Window - Fade Flows was broken - now fixed. Treemap Window - Help button was broken. Added persistent cache of network hardware vendors. WiFi Monitor - Show network hardware vendor. WiFi Monitor - Enable wireless network table column sorting. ASN Query - discover IPv4 and IPv6 origin networks. List Editor - add Clear button. Flow Distribution - Show/Hide the probability Tooltip. Map Window - Window would not expand to full screen. Increment the minor version number. Show cumulative distribution in Flow Distribution window. Add finer grained controls to Flow Distribution (scaling, class width etc). Use the significantly faster Jenkins "Spooky" hash for hashing flows. Previously used Jenkins "One at a time"
Flow Distribution window for monitoring DNS server reponse. Automatic text scrolling in TCPDump window. Monitor point-to-point links (e.g VPN links). Traceroute - Estimate bandwidth for each hop. Fixed crash when invalid MAC address found. Minor fixes for High Sierra compatibility. Flow Monitor - Allow multiple Flow Monitor windows. Flow Monitor - Use Netflow V5, V8, V9, IPFIX as flow data source (using nfacctd from the pmacct project). Desktop Image - generate image in a background thread to prevent stalling of UI. Flow Monitor - Race condition on close causes possible deadlock. El Capitan and Yosemite - compatibility issues. Traceroute - add option for using TCP probes. Desktop Image - fill style was not being restored correctly. Use Map, Local Network or Treemap as Desktop image. Local Network window - hosts may be sorted by recent activity. Local Network window - Improved neighbour detection. Added Scroll to End toolbar button in main window. Possible deadlock when closing WiFi Monitor. Main window output restricted to 10000 lines of text. Possible crash when terminating an external process. Fix Ping jitter statistics for corner cases. Select outbound interface in Trace, Ping, Netscan and Portscan. Fix Crash at startup on OSX 10.11 (El Capitan). WiFi Monitor - New window to display attributes of the WiFi Network. WiFi Monitor - Optional tcpdump of wireless interface in monitor mode. Tcpdump - New command on main window. Simple wrapper around system tcpdump. No bugs found or reported in previous version (2.0.15). Local Network - Display background image in Local Network window. Local Network - Text is coloured black when backround image is light, otherwise white. Local Network - New icon for wireless routers. Local Network - Right click on window background shows context menu for add/delete background image. Help Viewer - External URLs are now opened by the default browser. Help Viewer - Updated to use WKWebView. BUG - Tabbing between text fields was not working. BUG - Crash at close (regression in 2.0.14). Local Network - Right click on a host displays a menu of commands (Currently only Ping). Menu Bar - Added 'Flush DNS'. This clears the internal cache and also restarts mDNSresponder causing it to also reinitialise its cache. Local Network - Flow paths between hosts are drawn as a curve (previously was a straight line) to help distinguish paths. BUG - Opening the Inspector window would sometimes cause a crash. Local Network - Broadcast host is now displayed. Local Network - Added new window to visualise/monitor hosts on the LAN. Detect network interfcae changes via notification instead of polling. Tree maps refactored for more efficient implementation. Help buttons link to built in documentation. NSException handler for posix spawn calls. Flow Monitor - Improved packet capture from interface. Flow Usage - Added new window to visualise flow data as a treemap. Preferences - Map window preferences are available in Preferences window. Sparkle Updater - Upgraded to Sparkle 1.15.1. GeoLocation - Use a local copy of the Maxmind data (optional). Help - Added builtin Help files plus viewer. Location services - Make interface consistent with Apple Maps. Bandwidth Monitor - correct graph for times when network interface is unavailable. WhatRoute can now use Location Services to determine more accurately your location for display on the maps. This data is only held locally by WhatRoute and is never propagated to any 3rd parties. Should you choose to Deny access to Location Services, WhatRoute will continue to function using your external IP for local geolocation. Bandwidth Monitor - Add optional linear scaling. Bandwidth Monitor - Option for either exponentially weighted or sliding window smoothing. Logging - Log to ~/Library/Logs. Mapping - Use embedded MapKit for detailed view. Mapping - Use LocationServices to determine current location. Mapping - Options to show/hide routes/flows. Menubar - Added icon/bandwidth to System Menubar. Preferences - now implemented in 2 panes. Preferences General - AddedStart at login option. Dispatch queues - reduce number of dispatch queues/threads that are used. Inspector window - was dependent on Flow Monitor being visible. Timers - use a single timer to schedule tasks. This maintenance release is primarily concerned with CPU and memory performance of the WhatRoute monitoring functions (Bandwidth and Flows). Mapping - Use Apple Maps - Google Maps is optional. DNS Lookup - Option to show server trace. Flow Inspector - Show DNS Cache statistics. Bandwidth Monitor - Show filled graphs. Netscan - Sort final results. Intermediate results are unsorted. DNS - Use CFHost to enable query timeouts. Bandwidth Monitor - More efficient plotting. Bandwidth Monitor - Add setting for graph refresh rate. Flow Monitor - Only capture 128 bytes of packet. Bandwidth Monitor - Fix 32 bit overflow on byte counters. Flow Monitor - Dont send packets to the main thread. Memory leaks - Fixed multiple memory leaks. Race conditions - Fixed multiple (minor) race exceptions. Bandwidth Monitor - New feature. Traceroute - Provide output formatting option. Flow Inspector - Show current IP and location. View on Google Maps. Detached pop-over windows were being corrupted. Flow Monitor - Show source and destination ASN. Flow Monitor - Show TCP connection state. Flow Monitor - Use the pktap interface to capture packet metadata. Flow Monitor - Use lsof to capture process socket info. Flow Monitor - Minimise number of packets dropped while busy. Flow Monitor - Right click Process or PID to see the binary in the Finder. Flow Monitor - Run at startup if it was running when WhatRoute last terminated. Inspector - Show packet capture statistics. Location - New command to show address physical location in text window. Map - Line thickness indicates the bandwidth used in the flow. Flow Monitor - Fixed crash trying to display -ve numbers. Port Scan - Fixed race displaying number of probes sent. Traceroute - Fixed crash if source address is unavailable. View Menu - Items that were previously only available in popup menus. Bogon Updates from cymru - always wait 24 hours between updates. Combo Boxes (Hosts, DNS, Whois) - Editor to add/delete/order items. Flow Monitor - Overall efficiency improvements. Flow Monitor - All machines on LAN have same location if NAT'd. Flow Monitor - Display process name, PID and App icon if possible. Flow Monitor - Right click on PID or process name to terminate process. Flow Monitor - Display source and destination locations. Inspector - Show location cache statistics. Netstat - Added verbose option. Whois - Set server specific options (e.g. for RIPE). Race in Donate that prevented window from being dismissed. Race in Flow Monitor that could cause memory corruption. IP Locations - Asynchronous lookup to give speedier map updates. IP Locations - Refactor storage to save memory. Map - Display IP location accuracy_radius - as supplied by MaxMind. Map - preload country locations. Map - mouse tracking consumes less cpu. Whois - now has a default set of whois servers. Fixed possible buffer overflow when displaying IPv6 addresses. CFBundleVersion changed to decimal. Previously was hex. Version 2.x.x is a major revision of WhatRoute. Some functionality present in earlier versions has not been implemented but can be added on request. Thank-you to all the users who have followed the 'Donation' links. Earlier versions of WhatRoute are available from the links on this page. Preferences - Enable/Disable Sparkle Updater. IP Locations - Now uses data from Maxmind GeoLite2. Map - Right click on flow endpoint to show location in Google Maps. Map - Left click on flow endpoint to display nearby networks. Map - Windows detached from popover controls are resizeable. Map - Display flag when mouse hovers over country which has had active flows. Map - Adjust width of lines used to draw flow paths. Mapped flows may be coloured by port. Flow updates are paused while context menu is active. Only relevant items enabled in flow context menu. Display 'busy' indicator while a command is running. Divide by zero when points on map are very close. Auto-detect IPv4/IPv6 addresses in the Host field. Auto-refresh Interfaces and Neighbours display. Advanced flow filtering using Apple Predicate Editor. Crash when receiving malformed data from a whois server. Spurious timeouts in Trace and Ping. Improved asynchronous address to name resolution. Flow Monitoring of remote hosts - requires small helper on the remote host. Please contact me if you wish to try this. LAN MONITOR - Show individual flow bitrates. LAN MONITOR - Updated tcpdump. LAN MONITOR - Optional display of fields in flow table. LAN MONITOR - Sort fields in flow table. LAN MONITOR - Added Pause/Resume button. OPTIONS - User settable ordering of the command popup menu. WHOIS - Fixed crash when TLD has no known Whois server. HELPER - Copy WhatRouteHelper to ~/Library/Application Support. PING - fix display of source address. Main window - fixed tabbing between input fields. Google Earth - Better handling of meridian crossings. LAN MONITOR - Show network flows on the world map. PING - Show source and destination on the world map. ADDRESS SCAN - Show source and destination on the world map. INTERFACE MONITOR - Use either Linear or Logarithmic graph scales. MAP WINDOW - Buttons initiate Google Eart, link to the MaxMind site and select the colours to use for network flows. Internal - Fixes problem with starting the helper program. Internal - Better scrolling in text windows. Internal - Caches are all xml property lists. There is a minor problem in WhatRoute 1.10.6 that will prevent it from launching if it is run from a folder containing space characters anywhere in the path. Please install it into a folder that has no spaces in the path name. If you are still experiencing problems, the simplest work-around is to copy the program to your /Applications folder or otherwise contact me. ASN - New command for finding the ASNs to which a network either belongs or with which it peers. TRACE - Show ASNs (optional) on traceroute display. Map - Fixed scroll-wheel behaviour on Lion. Map - Cursor tracking fixed on scrolled map. Map - Show ASN in map drawer. Graph - Host/address can now be entered on the Graph window. Graph - Retain server addresses when stats are cleared in Graph window. Graph - Show ASN on hop statistics. Tree - Show ASN on node details. Internal - More reliable initiation of WhatRouteHelper. Scan - Add port scan. Whois - fixed crash when a whois server could not be found - thank-you wikileaks.org. Ping - fixed formatting of the summary report. Geotrace - Use the MaxMind GeoLite City data hosted at www.whatroute.net. Geotrace - Expire old entries from the database periodically. Geotrace - Use UTF-8 for displaying country data. Internal - Fixed crash with Trace command. Internal - Fixed URIs for data files. Internal - Moved string resources to a '.strings' file. DNS - added an option panel that enables a user to use alternate name servers - e.g. the google name servers. Traceroute - The user can set the hop from which to start returning results. Geotrace - reworked algorithms to use DNS LOC records. Whois - Major code cleanup focusing on handling recursive queries. Whois - Added a control to show/suppress the display of standard server disclaimers. Network scan - simpler interface for setting the network mask. DNS Query - report record types LOC and AAAA. DNS Query - Changed default class to ARPA (IN) - was ANY. Ping - fixed output formatting. Interface - Added Help menu. Interface - Add 'Bring All To Front' menu item. Interface - Dont run when application is on read-only media. Internal - tasks and threads are more dynamic further reducing idle load. Internal - Geolocation/DNS cache is more efficient. Internal - fixed memory alignment issues with some Mac models. Internal - run 'Check for Update' in background to prevent UI from freezing if web server is down. This release does not have many externally visible changes but I have put significant amounts of work into refactoring the code with a net reduction in memory footprint of approximately 10MBytes and a significant reduction in CPU usage. Older versions are not supported as I no longer have the required hardware and software.